Gmail has finally got a new contact manager, which is 100 times better than the earlier one. The new contact manager is fast and easier to use, and is definitely a welcome change to one of the best email services available online today. I have been a Gmail user for a while now and to be frank, managing contacts was definitely a pain. 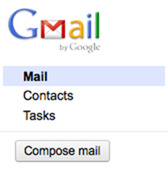 The older contacts interface was mediocre at its best when compared to how powerful Gmail in itself was. However, that is now a thing of the past as Google is rolling out a new contact manager for all Gmail users starting today. The new contacts manager has a more prominent link as seen in the first screenshot above and will also work pretty much like Gmail works, fast. The new contacts manager now supports Keyboard shortcuts, sorting by name, custom labels for contact fields, ability to undo changes you made and automatic saving just like Gmail compose among other things. In addition to the contact manager changes, Gmail also sports links to Mail, Contacts and Tasks in the top left and displays a Compose mail button instead of a text. There is also some screen estate recovery thanks to the reduction in the header area. However, Google has also made it a bit painful to select messages by removing the links and putting it into a dropdown. Overall these changes are pretty good and make Gmail the best free email service out there. The new changes to the Gmail contact manager and overall email layout will be rolled out to all users in a phased manner.